Blogger and singer/songwriter�Heidi Petite�has a colourful, “anything goes” style that is all her own. We caught up with her to get her thoughts on all things festival. Describe your typical festival style? ANYTHING GOES AND BEYOND. I bring more fancy dress accessories than fashion�accessories to festivals. All normality goes out the window. Tell us a typical day for you at a festival? 1. I get dressed up sassy as hell, rainbow and glitter galore, wigs and fancy dress. 2. Eat loads of good festival food to prepare myself for a busy day. 4. Figure out all the main acts I want to see for the day then PaRtY pArTy Partyyy. 5. Stay out till the sunrises, sleep a while, then do it all again! Where are we most likely to find you hanging out? You’re most likely to find me hanging around a folk performance or an upcoming and�undiscovered stage. Finding new music at festivals is always so rewarding! So excited for�Secret Garden Party this year because they always have the best upcoming acts! What band gets you ready to party? GREEN DAY, BLACK EYED PEAS (always) Justin B�s tunes are compulsory and Eminem always�makes an appearance. But my ultimate pardddy song to get me in the mood is Earth Wind�and Fire, and September! Kanye, Avril Lavigne, Eminem, Prince, Amy Winehouse? Nothing can beat a squad like that! What are your must-have festival essentials to pack? 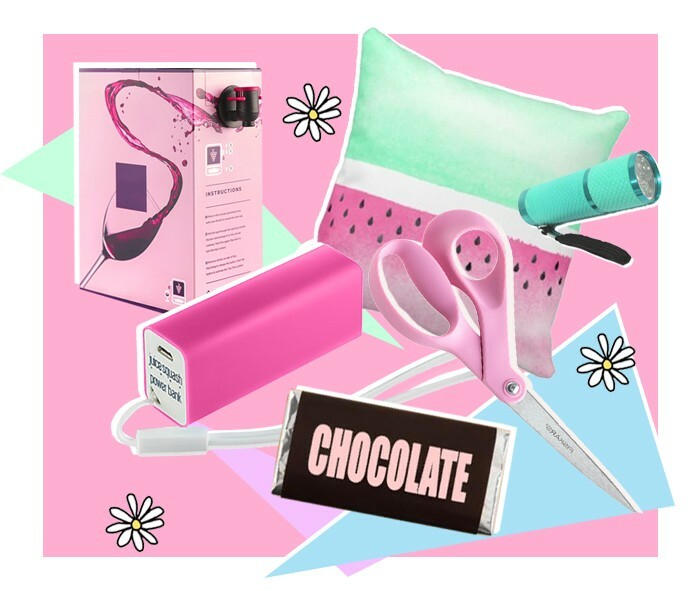 Portable charger, scissors, pillow, chocolate snacks, GLITTER and WINE BOX�S. Nothing else�needed haha! 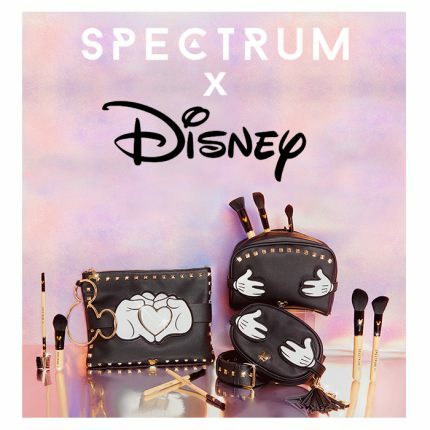 Fave trend you�re looking forward to reppin’? I am of Indian heritage and i want to embrace it more. I want to incorporate my Indian�side towards fashion, festivals and any occasion. I love the culture! GLITTER LIPS!!! Although it usually ends up all over my face by the end of the day! How do you document your experience? Instagram! I never get signal at festivals so it hard to keep up to date with snap chatting,�but I always find a way to instagram at the end of a day! What�s the one thing you couldn�t live without at a festival? A night light, Other wise i�m falling over all sorts of things in a pitch black tent. I also cant�sleep in the dark, it scares me! Beauty hacks to keep you looking fresh? Wash and curl my hair the day I leave and use dry shampoo for the rest of the trip. Also�Face wipes, face cream and baby wipes are essential. CONFETTI CROWD. MY GIRLS ARE ALL I NEED A FESTIVAL. We all love the same music and�different music but we all enjoy it together, stick together and have such a magical time. Have you had any festival mishaps or disasters? I lost my crew, ran out of battery and was very far from home. I had no money, I was drunk�and I hadn�t eaten all day�But Love Box Festival you were fabulous! Sneaking into Global gathering when I was younger and having the craziest evening. We�ended up sleeping on the global sign underneath the stars! Best festival hangover cure? How do you gear yourself up for round two and how do�you detox when the festival is over? Festival�s are Magic! I never get Hangovers, I always feel so fresh and alive when I wake�up! eating lots of food and drinking loads of water before bed always helps too.�I get the worst festival blue then i come get back to reality, best thing to do it sleep it off�and start to plan the next festival adventure! Burning Man festival. I’ve always wanted to go, hopefully ill be able to attend in the next�couple years before it comes too mainstream. Honestly one of the best festival acts I’ve ever seen were rudimental: the set, sound and�performance was incredible! I was so surprised as I don’t really listen to their music but I’m�now a massive fan. Michael Jackson! I know he�s in heaven but he will always be my No1 artist on the entire�planet. Michael made me fall in love with music when I was younger and he�s my biggest�inspiration. 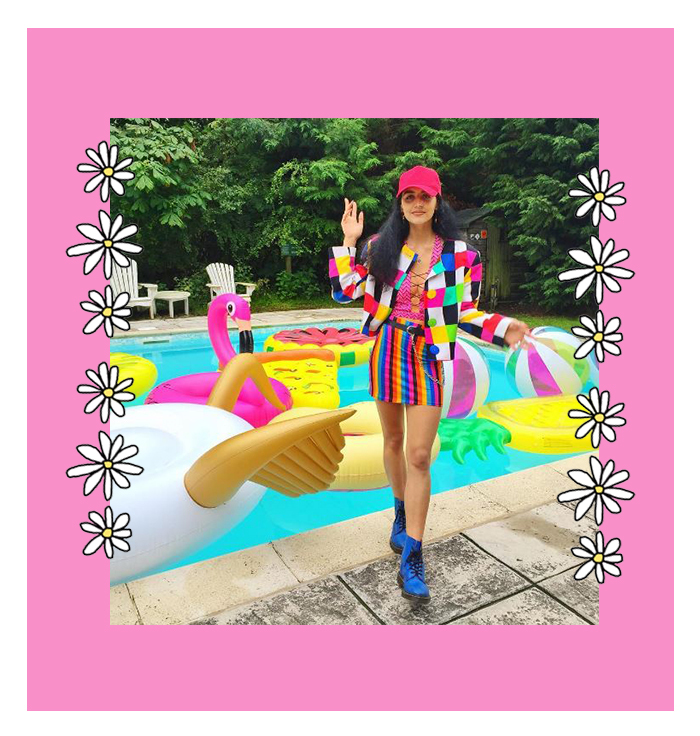 Favourite festival vibes PLT piece of clothing and why? White kimono with Rainbow Pom Poms! INSANE IN THE MEMBRANE. I reckon it will fit any�outfit, as well as keep me warm and look A*!